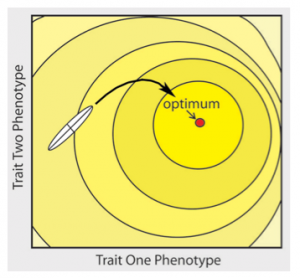 Yea, multivariate quantitative genetics in one easy lesson! Of course this assumes you know linear algebra. For those poor pitiful folk who maybe aren’t completely satisfied with my derivation I perhaps should expand on this. There are some interesting points to note about this. Most important, is that although the traits are listed separately, they are correlated. Thus, if we select on one trait, the other trait will also change. Thus, even if selection – i.e., survival and reproduction, is ONLY affected by body size, changes in brain size will also occur. This is rarely talked about, but it will be important when we talk about multilevel selection. As a result, lets give it a name. 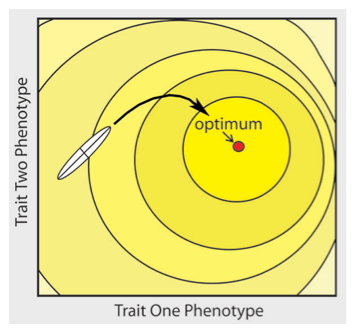 When selection acts on one trait and causes a change in another trait within a generation, and before reproduction, lets call it indirect selection. This is different than a correlated response to selection, which would occur if selection on body size were to change the brain size in the offspring. Thus, looking at S alone will not actually tell us what selection is acting upon. To find this out we need to include the phenotypic covariance matrix. This is a matrix that has the phenotypic variances on the diagonal, and covariances on the off-diagonal. Of course we need to “divide” by the P matrix, which we cannot do, but we can multiply by the inverse of the P matrix. This is easy enough with a 2X2 matrix, but if you want to use more than two variables get a computer! With the fervent hope that I got this right from memory (damn, I need internet) we can multiply this with the selection vector to get the “selection gradient”. Although I appear to be unable to do the math while sitting here listening to talk of Franz Boaz, issues of race and racism, and the new synthesis, this gradient, gives us the direct effects of selection. That is, it mathematically removes the indirect selection from the equation, and only shows the direct effects of selection on the trait. 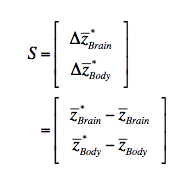 Thus, if there is selection acting only on body size, both brain size and body size will show changes as a result of selection (the S vector), however, the gradient (beta) will show that there is only selection acting on body size. However, there are a number of other issues that are more rarely discussed. One is that you really can only study selection on a few traits, perhaps four. More than this is a statistical nightmare. More importantly, if you actually do a study of this sort you will find that it is very sensitive to the assumption that you have in fact measured the traits that are under selection. If you add or remove a trait from the analysis you will get a qualitatively different result. The reason for this is that this analysis of selection is technically miss-using multiple regression. 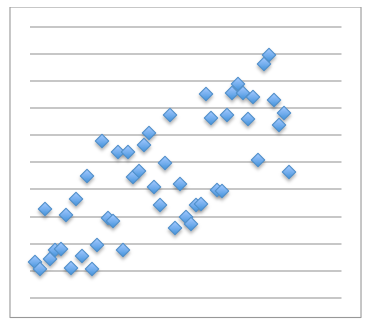 No matter how we dress it up regression is basically a glorified correlation. Thus properly used we would ask how is fitness best predicted by the traits we have measured. In fact, in the setup I have outlined we are asking how is fitness caused by the traits we have measured. Thus we are miss-using regression and pretending it is a causal analysis. For the most part we will live with this lie, however, if we wanted to be honest we would do a path analysis, which Sewall Wright specifically called a causal system of analysis. To learn this I recommend the out of print book Li, C. C. (1975). Path Analysis: A primer. Pacific Grove, CA, The Boxwood Press. (Interestingly, adjusted for inflation the cost is the same as it was when it was originally printed). The important insight from this is that properly done the causal paths of path analysis are determined by study and an understanding of the biology of the system. The statistics is added on afterwards to determine the strength of the paths. This I think is a generally important point. Statistics is a tool, and never can and never will substitute for a knowledge of a system. Another point is that in essence all selection is on “fitness”, and a sense all selection on traits is indirect selection. This is why Arnold and Wade called the variance in relative fitness the “opportunity for selection. (Arnold, S. J. and M. J. Wade (1984) 38: 709-718). That particular conceit aside, another point is that traits we measure are almost never the traits that are actually under selection. Remember that I described the phenotype as a vector that goes from birth to death. As such when we measure a trait it is usually a measurement made at a particular point, whereas selection is acting on a more cumulative measure of a similar correlated trait. For example, I once did a study where we measured photosynthetic rates. These instantaneous measures made at a particular time of day, on a randomly sampled leaf, at a particular point in the life of the plants. We made the reasonable assumption that this instantaneous measure was representative (read correlated) with the trait we were really interested in, which is the intrinsic photosynthetic rate of that plant. The point of this is that all selection studies need to be taken with a grain of salt. That said most investigators do a pretty good job, and most results are probably at least qualitatively correct. We have to be careful not to be curmudgeons that think that all science is useless because we cannot do it perfectly. This entry was posted on Thursday, July 11th, 2013 at 2:40 am and is filed under Uncategorized. You can follow any responses to this entry through the RSS 2.0 feed. You can leave a response, or trackback from your own site.